Fiber gummies contain high dosages of fiber that binds to water and turns into a soft gel. This slow-digesting gel moves slowly across your digestive system, signaling your brain that you're feeling full. In turn, your appetite is suppressed and you don't feel the need to eat as much as before. This helps you avoid overeating and cuts you calorie intake. Unlike other weight loss dietary supplements that contain stimulants, fiber gummies are safe. In fact, they are good for your overall health and immune system since they boost the health of good bacteria in your gut. Who Else Want to Lose Weight with These Tasty Fiber Gummies? Sick of bland meals and boring diet plans? Feelings of restriction? You aren't alone. The fact is, most people don't enjoy diet meals. It's certainly not pleasant cutting out foods you love, and certainly not fun trying to work out when you'd rather collapse onto the armchair watching the latest episode of Modern Family. 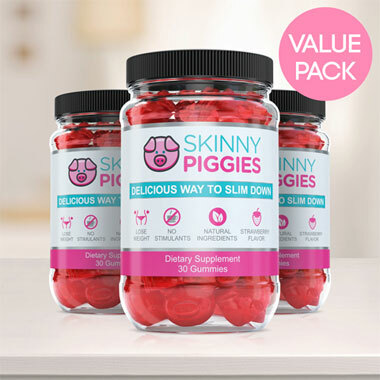 Thankfully, now you can support your weight loss by indulging in remarkable, natural appetite suppressant supplement, Skinny Piggies! 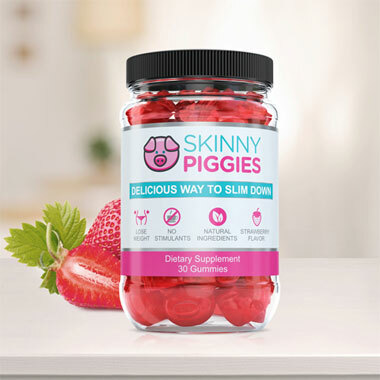 Skinny Piggies are great-tasting fruit gummies that lessen hunger and food cravings while supporting your body to stay in fat-loss mode. Before we talk about what Skinny Piggies fiber gummies are, let's first make sure you understand what is required for your body to start losing fat. 2) A meal plan that's satisfying enough that you can stick to it for a long time. Sad to say, most fat-loss plans skip one or more of mentioned points. To really see better success with your diet program, it's critical that you eat less calories than you burn off each day. You could do that in one of two ways: boost your caloric output with exercise or lower your food intake. Doing both is best. If only fat loss were this easy. Even though cutting back on your daily calories sounds easy enough, in practice your powerful cravings are more likely to make you thinking about sugar treat the whole day. And that's when Skinny Piggies diet gummies can really help you. Skinny Piggies are fun, sweet healthy treats you won't need to feel guilty about! Enjoy the savory taste of these fiber gummies and let them do the rest of the work. Ok, exactly what are the gummies good for? The science is very simple. Your hunger is caused by 2 key ways: the number of calories you consume and the presence of food in your stomach. After a big meal, your stomach expands from the food pressed up against the sides, which results in you feeling satisfied and you stop eating. When you eat one Skinny Piggy approximately 20-30 minutes prior to your meal with a 16-ounce glass of water, it will gently form a gel, activating stretch receptors in your stomach, letting the brain know you just consumed a lot of food. When you eat your meal later, you are already partly full and eat less calories because of it. This way you can combat appetite and eat much less, all without feeling like you're eating less than before. The gel enables the stomach to empty slower and that makes you full much longer. The sooner you are full, the less likely you are to remain to eat and that allows you to eat much less calories. As the liquid gel surrounds the food you ate, it will slow down the digestive function of carbohydrates that normalizes the blood sugar level. By avoiding sudden changes in your blood glucose level you prevent those intense cravings. When you eliminate blood glucose spikes by slowing down the digestion of sugars you are preventing it from being stored as unwanted fat and that then activates the body to burn off its stored fat. The slower the intake process the longer the body achieves fat-loss mode. So you may be thinking, what is so different about Skinny Piggies versus the other weight loss products you see in stores? First, Skinny Piggies have no artificial ingredients. Take one look at any weight-loss supplement and you'll see a list of chemical names that you can't pronounce. Yummy Flavor: Few weight loss supplements actually taste good, and almost none of them have the delightful taste of strawberries, that's exactly why Skinny Piggies gummies are a treat you'll look forward to. Nutrient rich Nutrients: Not only will Skinny Piggies help you slim down, they also support the growth of stronger hair and help your skin glowing. No Chemicals or Stimulants: Using a weight loss supplement without harsh stimulants and that's why you can take them at night, and the gentle formula means that Skinny Piggies are easy on stomachs. Genuine Ingredients: Unlike most weight loss products, it's actually easy to pronounce every active ingredient in Skinny Piggy diet supplements, knowing that you're eating the best quality nutrition. Losing weight is difficult, but our delicious gummies are here to make the process more easy. You will love the flavor of these gummies so much, remembering to take them every day won't be a problem. 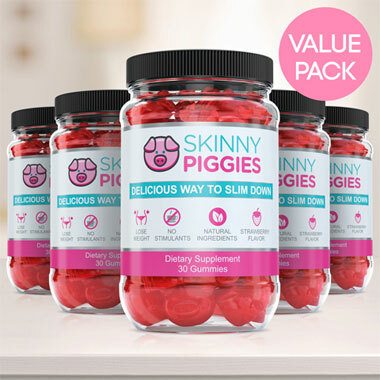 Easy to take and verysatisfying, Skinny Piggies are weight loss gummies that is fun to take.